In the Midwest, communities race to replace dwindling auto jobs with renewable energy ones, but workers will have to sacrifice on their pay. Iron workers at the Minster Machine Company start at $17.50 an hour whether they're making parts for the wind or auto industry. Detroit's Youth: Stay or go? The young people of Motown have a tough choice: Go where the jobs take them or stick around Detroit and tough it out. Are you open to the idea of buying a GM vehicle in the future? 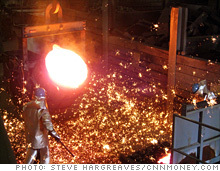 NEW YORK (CNNMoney.com) -- Massive investment in renewable energy could ultimately create 4 million manufacturing jobs. But for the workers in the bottom rung of this movement, the shift to green jobs could very well mean a pay cut of nearly 60%, a trend spreading across the entire manufacturing sector. "Particularly at the lower end, these are not very good jobs," said Philip Mattera, research director at Good Jobs First, a labor-friendly research group, also acknowledging that the renewable energy sector paid wages that were "all over the map." Talkback: Is $12 an hour a decent wage? Americans are betting that molding steel wind turbines, slicing silicon for solar panels and making batteries for electric cars will put them back on top of the manufacturing game. The 4 million new jobs, estimated by the University of California, Berkeley, would bring back more than half of all the manufacturing jobs lost in this country since the sector's heyday in the late 1970s. At a battery plant just outside Indianapolis, job growth could boom. The plant is owned by EnerDel, the car battery division of Ener1 (HEV). Here, the company is racing to build a cost competitive battery for an all-electric car. If it gets a government loan it's applying for, the company plans on hiring up to 3,000 people. That's roughly what a big auto plant employs. But $12 an hour is the starting wage for a production worker. While the starting wages at EnerDel are lower than what the auto industry pays, company executives stressed salaries go up quickly as skill sets improve. They also stressed a company like EnerDel employs lots of skilled workers too, from the electrical engineers needed to design the batteries to the mechanical engineers who build the machines. A level pay scale. The diversity of jobs in the renewable energy business is one thing supporters of green manufacturing tout. They say people should look beyond the starting wages for labor when judging the industry. "I cannot think of an industry that has more diversity in wages," said Jackie Roberts, director of sustainable technology at the Environmental Defense Fund. Plus, $12 an hour is in-line with the average wage for an electronics assembler in the Indianapolis area, according to the Labor Department. It's a similar scene at a plant making silicon for solar panels up in Michigan. Just outside of Saginaw, an executive at Hemlock Semiconductor would only say the company paid "competitive wages." But people in town said the non-union Hemlock plant paid around $10 an hour for unskilled production workers and $20 an hour for skilled ones. Mike Hanley, president of the local United Auto Workers union, said he hoped green manufacturing will become more unionized going forward. But he agreed that the wages at Hemlock were pretty good for the area. Not just green industry. Environmental Defense's Roberts notes that besides new companies making things specifically for the renewable energy business, as is the case with EnerDel, there are also lots of manufacturing firms that make components for both the green and traditional industries. "There are manufacturing jobs," she said. "They have the same wages as anyone making components for any other industry." That's the case in Minster, Ohio, where the Minster Machine Company turns out both parts for wind turbines as well as machines for other the auto and food processing industries. Inside the company's massive iron foundry, workers start at $17.50 an hour whether they are pouring castings for a wind turbine hub or an auto stamping machine. But the company's president, John Winch, noted that in the long run, wages in the U.S. will probably come down as wages in the developing world come up - all part of the globalization process. "The wage scale will probably be more dependent on what the world's wage scale is," said Winch. Even in the auto industry, $28-an-hour is no longer the starting wage. Since 2007 the industry has had a two-tier wage system, meaning that when they start hiring again the new starting wage will be $14 an hour.